This World Politics in a Time of Populist Nationalism (WPTPN) guest post is written by Dr Cynthia Banham, a University of Queensland Post-Doctoral Fellow at the School of Political Science and International Studies. She is also a Visitor at the School of Regulation and Global Governance (RegNet) at the Australian National University. Her forthcoming book, Liberal Democracies and the Torture of Their Citizens, will be published by Hart Publishing in 2017. She can be reached via e-mail and Twitter. Cynthia would like to thank Professor Susan Sell for her comments on an earlier version of this blog post. Political accountability, we are taught to believe, is a defining feature of liberal democracies. A basic relationship of accountability lies at the heart of democratic government: citizens elect their political representatives, and these representatives become accountable to voters. Yet political accountability, as we have traditionally understood it to exist in liberal democracy, is under stress. Since September 11, 2001, liberal democracies have seen an escalation in attempts to decrease government transparency and limit civil society’s ability to check arbitrary power. One only has to think of the USA PATRIOT Act or the US detention regime at Guantánamo Bay. We see a pattern emerging across liberal democracies of the erosion of accountability in important policy areas. The re-emergence of torture as a potential state national security tool in the United States under a Trump Administration is a reminder of what is at stake when political accountability is avoided for past government wrongs. Australia is not immune from this trend and I want to focus here on one particular policy area where there has been a deliberate and drastic reduction of accountability on the part of government: asylum seekers and refugees. In 2015, the Australian government placed a gag order on doctors working in the country’s offshore immigration detention centres to prevent them from speaking out about what they witnessed there. Conditions in the camps, located on small islands in the Pacific, are kept deliberately harsh to deter asylum seekers from coming to Australia by boat. Doctors who violated the gag order faced two years in jail. This audacious example of executive-overreach is typical of increasing attempts by governments across liberal democracies to reduce accountability for their policies. Rising populist and nationalist pressures threaten our notions and practices of democratic accountability. Anxious citizens wonder just how far governments will go in order to prevent scrutiny of their actions and how civil society can effectively resist anti-democratic government policies. The case of the Australian doctors highlights these dangers but also contains another lesson. Civil society may successfully resist autocratic moves by liberal democratic governments to avoid political accountability. In September 2016, eleven months after the Australian government passed the draconian Australian Border Force Act 2015, it quietly lifted the gag order, allowing doctors to speak again without risk of prosecution. This is a story about alarming anti-democratic suppression of an entire professional community involved in caring for the well-being of asylum seekers and refugees in Australia’s offshore detention camps – and how it successfully pushed back, and recovered some government accountability in this contentious domain. The events depicted here suggest citizens are going to have to be watchful and creative in mobilising to take back their power and be an effective check on government. 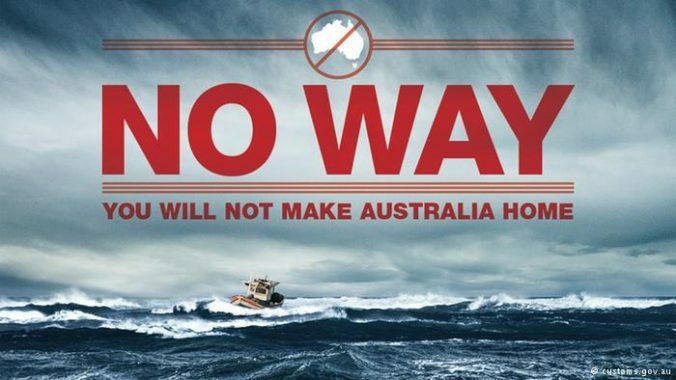 The harsh treatment of asylum seekers arriving by sea is popular policy in Australia, where political leaders have mercilessly exploited the issue since 2001. Why 2001? In August that year, a couple of weeks out from the awful events of September 11, a dramatic stand-off occurred between a Norwegian freighter carrying hundreds of rescued (mostly Afghan) asylum seekers bound for Australia and the Australian government. The government refused to let the freighter enter Australian waters with its human cargo, and the result was the establishment of the ‘Pacific Solution’. Under its most recent incarnation, which dates to 2013, asylum seekers who arrive in Australia by boat are detained on Nauru and Papua New Guinea’s Manus Island, with no access to Australian courts, human rights non-governmental organisations, lawyers or journalists. The vast majority of these asylum seekers have been found to be refugees; among them are many Iranians, as well as Afghans, Iraqis, Sri Lankans and others. The United Nations Special Rapporteur on Torture, Juan Mendez, has noted that Australia’s indefinite detention of asylum seekers and refugees, including children, in offshore camps where conditions are inadequate and there is escalating violence and tension, breaches its international legal obligations under the Convention Against Torture. With asylum seekers so well hidden from view of the Australian public in these remote detention centres, accountability of government policy was already seriously compromised. But last year the Australian government pushed the boundaries even further in its efforts to prevent any information at all from seeping out of the camps about the suffering and desperation of detainees inside. In silencing health professionals who treated asylum seekers, the Australian government tested the levels of state secrecy that citizens were willing to accept as never before. This was about prohibiting medical professionals from raising concerns about matters as abhorrent as the sexual abuse of young children, in conditions of arbitrary detention. What light does this Australian example shed on shifting conceptions of political accountability? I consider some understandings of both government and civil society, before starting to theorise the changes I am drawing attention to. First, in seeking to avoid public scrutiny of the human cost of its asylum seeker policies and thus ensure continuing domestic support, the Australian government has adopted increasingly radical, illiberal means of quashing dissent, shutting down traditional sites of accountability. It has, in other words, created deliberate sites of non-accountability. Its means of achieving this include the Australian Border Force Act, in addition to longer-standing practices of alienating detainees, physically separating them from civil society and constructing them ideologically as potentially dangerous outsiders. The Australian government has, in addition, hired out contractors to run the detention centres, and has located them on the territories of foreign sovereign states. These practices intentionally abdicate public accountability. Second, despite the government’s best efforts to prevent it, citizens still demand accountability and have adopted innovative strategies designed to influence the political environment. The government, in lifting the gag order on doctors, responded to widespread, multi-faceted protests by medical professionals across Australia. The Australian Medical Association and the World Medical Association condemned the silencing of doctors, saying it contravened basic principles of medical ethics. Senior mental health professionals openly challenged the government to prosecute them for speaking out about the ‘torture-like conditions’ in offshore detention centres. A Brisbane hospital engaged in a public stand-off with the government, refusing to discharge a one-year-old baby who would have been transferred back to the detention centre on Nauru, on the basis it was not safe for the child. The group, Doctors for Refugees, filed a constitutional challenge in the High Court of Australia against the Act, warning of the chilling effect the legislation was having. The nature of doctors’ protests varied: some were organised, some were more spontaneous, some sought to activate traditional accountability mechanisms (the courts) and some went outside those institutions. The events in Australia invite closer examination of shifting notions of political accountability in present-day liberal democracies. Accountability, we are often reminded, is a concept that is ill-defined and not well understood. Traditional notions of accountability are based on hierarchical structures, while in practice networked governance has become more important. Certainly the Australian case demonstrates the importance of networked governance, and how actors from disparate groups with relatively little power can, when they organise, have an unexpected impact on hierarchically-imposed government policy and influence public policy outcomes. One can think of the accountability relationship between states and citizens as one based on power. Allen Buchanan and Robert Keohane, writing about the Obama Administration’s lethal drone program, note that accountability is essentially a power term, that: ‘Those who can hold policymakers accountable exercise power over them. That is, they have the capacity to impose costs on the policymakers and thereby to increase the likelihood that the latter will respond to their demands.’ Accountability, they note, depends on context and needs to be dynamic. Similarly, Peter Katzenstein, discussing his current work at a research seminar at the University of Queensland earlier this year, spoke about a decentralised form of ‘protean power’ that relies on the agility and creativity of actors, and can bring about transformative change in situations characterised by great uncertainty. The example of Australian doctors demonstrates how protean power works in practice. Disparate members of this community of medical professionals worked, sometimes in collaboration with legal advocacy groups and community legal services, in different parts of the country and in diverse forums to resist a deeply anti-democratic government order, to surprising effect. We live in a world where politics is deeply unpredictable, where aspiring political leaders and incumbents can succeed by promising to take away certain human rights. Often those whose rights are in question are non-citizens, or minorities or Muslims. Such policy promises are justified on the basis of popular appeals to sovereignty and national interest and they are, in practice, most easily achieved by minimising or avoiding traditional forms of accountability. In this context, the sense of obligation to give account and to hold to account is being undermined on both sides of the accountability relationship. Faith in the idea of accountability as a virtue cannot be taken for granted. Changing political environments encourage governments to test the limits of what is permissible in terms of decreasing democratic transparency, in order to give voters the outcomes they demand. It is well to remember also that civil society’s role in terms of demanding accountable government is complex and not pre-determined. Individuals and groups can resist and oppose the democratic state with more authoritarian proclivities, but they can also normalise and complement it too. At a time when politics across diverse liberal democracies are unfolding in ways previously considered unthinkable or unlikely, it helps to recognise the dynamism and unpredictability of power, and its centrality to accountability. Those who would resist attempts by states to avoid accountability require persistence and imagination when developing strategies to affect the political environment in unexpected ways, in ways governments cannot control, in order to achieve a more just outcome. Michael Grewcock, ‘The great escape: refugees, detention and resistance’ in State Crime and Resistance, ed Elizabeth Stanley and Jude McCulloch (New York: Routledge, 2012) 56. Kaifeng Yang, ‘Qualitative analysis’ in The Oxford Handbook of Public Accountability, ed Mark Bovens, Robert E Goodin and Thomas Schillemans (Oxford: Oxford University Press, 2014) 160-161. John Braithwaite, Hilary Charlesworth and Aderito Soares, Networked Governance of Freedom and Tyranny (Canberra: ANU Press, 2012). Allen Buchanan and Robert O Keohane, ‘Toward a drone accountability regime’, Ethics & International Affairs, 29(1) (2015), 15-37, 24. Penny Green and Tony Ward, ‘Civil society, resistance and state crime’ in State Crime and Resistance, ed Elizabeth Stanley and Jude McCulloch, 29. The Duck of Minerva’s WPTPN group is still seeking guest contributions. If you are interested in writing a post and have research expertise in international relations, international political economy, foreign policy, comparative politics, or cognate fields please see this post for more information. When Hell Freezes Over—Will Generals (and Admirals) Stop Global Warming and Bring Peace and Human Rights to the Trump White House? Please clarify: is lifting the gag order on medical personnel evidence of government responsiveness? If yes, why make a claim re: decreasing accountability? More generally, to what extent are Australia’s off-shoring policies and US counter-terrorism policies products of interest group competition for influence rather than unaccountability? That is, if we don’t see adoption of our preferred policy, is the state unresponsive to the public or perhaps just more responsive to the preferences of other citizens or pressure groups?